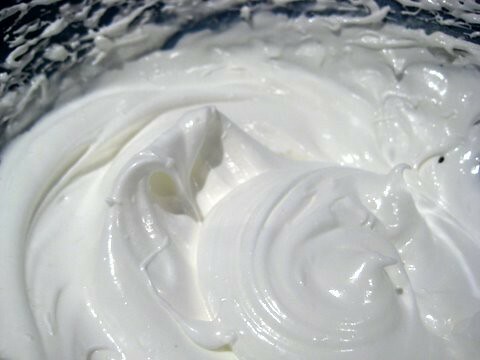 This meringue recipe makes the perfect party dessert and as they’re so easy to make it’s a great recipe for the children to try out for themselves. It also calls for a little showmanship and daring, much to the kids’ delight. I won’t make any attempt to pass them off as being a healthy option though as they are of course very sugary, but serving them with a pile of fresh fruit balances things out a little. This recipe makes mini meringues, which is a better child-sized portion. Not that I care about easing my conscience too much – they were for my birthday party after all! Preheat your oven to 110C / 225 f / Gas 1/4 and then place your egg whites in a large bowl. Let the children crack their own eggs – go on! If you have any stray pieces of egg shell it’s easiest to use another piece of shell to scoop them out as like seems to attract like. You only need the egg whites for this recipe. To separate them you can strain the egg through your fingers, keeping hold of the yolk. An easier way with children is to crack your egg on to a saucer or plate, then use an egg cup to enclose the yolk. Then you can pour off the rest of the egg white into your bowl. 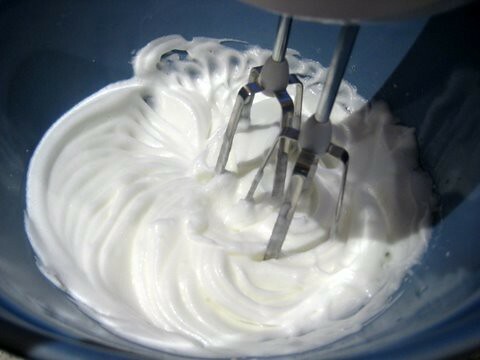 Use a whisk to beat the eggs until they form thick, white peaks. This is great fun for the children as the eggs totally transform in colour and texture as you beat in the air- science in action. When the egg whites are stiff enough you can hold the bowl upturned over your (or their) head and the eggs will stay in the bowl – ta-daa! Then whisk in the sugar, adding it little by little. 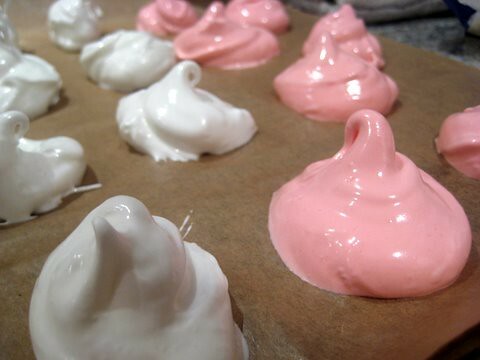 Line a baking tray with a sheet of greaseproof paper and use teaspoons to place 12 blobs of the meringue mixture on to the tray. Add a couple of drops of food colouring to the remaining mixture and very gently stir the colour through. 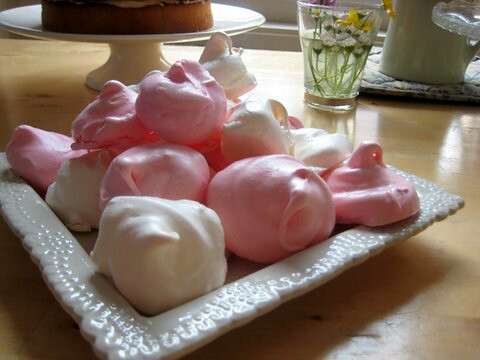 Use teaspoons again to make 12 blobs of pink meringue on the tray. Bake for 40 minutes, then turn off the oven. Leave the meringues inside the oven for another 5 minutes if you like yours to have a delicious chewy centre, for another 20 if you prefer them to be crisp. You can serve them as they are or sandwhich one white and one pink meringue together with some whipped cream. Serve with fresh berries and other chopped fruit. Just right for birthday or summer party. These look divine! Thanks for sharing your recipe! They are maryanne – you should try some! My daughter loves them,we’re making them right now! That’s fast action huana! Love your idea for adding flavours. That looks so yummy cathy! Is caster sugar same as normal sugar? Cathy, Here we get ready to use egg whites in milk carton shape cartons. Have you seen them? I guess that will be make the recipe more easy to make. HI Mama Pea Pod – I think they’re just the thing for a birthday party. You’ll have to let me know if you give them a try. I love these! Thanks for sharing the recipe! I’ve always wanted to try to make them, but I never have. They are so impressive, and I always think about buying some when I pass them in the grocery store. Hi Tara, what I especially like about these meringues is they do have a wow factor but are actually really easy to make. You should give them a try! wow they look amazing, so much so that I have just made some and they are in the oven cooking . Yes Julie, just a smaller size, but still as yummy! This sounds fun and not very complicated. My boys have been pestering me to make meringues ever since they tried them at a friend’s place and then read about them in a book. Will probably try it out with them this afternoon and see how it goes…they can make them for their dad for valentine’s day! Made them and they came out yummy! Also the boys loved beating the eggs …which made my life so much simpler!